I'm procrastinating. I haven't had time to focus on how to stitch the golden curly bit at the top of Wild Child. I know I'm going to embroider it with some sort of shading, but I haven't figured out a plan. So, what does one do when one is procrastinating? One finds distractions! There are plenty of other elements to finish, so that's what I've been working on. The bottom half is mostly complete and I'm now focusing on the upper half of the project. Almost all of the little light blue circles are finished. The last pair have to wait for the golden curly bit at the top (I call it 'Curly'). 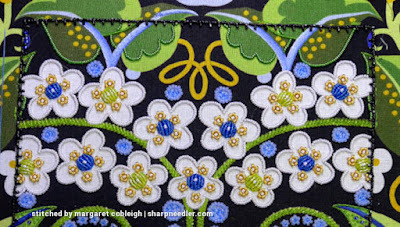 As I've worked on finishing various elements, I've been keeping an eye out for more places where I can add the royal blue beads I used at the bottom of this purse project. Currently, the royal blue beads are only used on the lower half of Wild Child and I'd like them to show up somewhere in the upper half in order to balance things out. 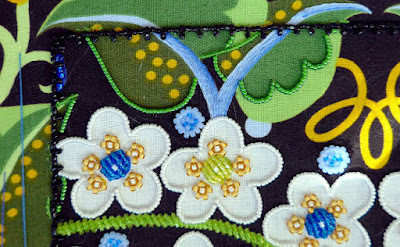 At the top of the purse there are a couple of bright green curved lines formed by cut-off tendrils and I wanted to make them disappear so I stitched over them in blue. 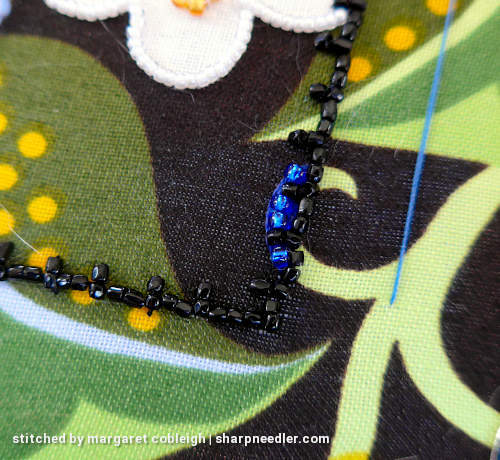 I thought I might be able to add some of the royal blue beads on top of the stitching. Unfortunately, I found the beads were too big for the space. If I was using a smaller sized bead it might have worked, but I didn't care for the large beads so they will be removed. I still had to find a place to add the royal blues. I was glad to dull down the bright greens, though, so the blue stitching over the green will stay. There were plenty of fiddly beaded leaf outlines to finish. Some lines were fairly long and some were quite short. A lot of short lines takes longer than a few long lines! 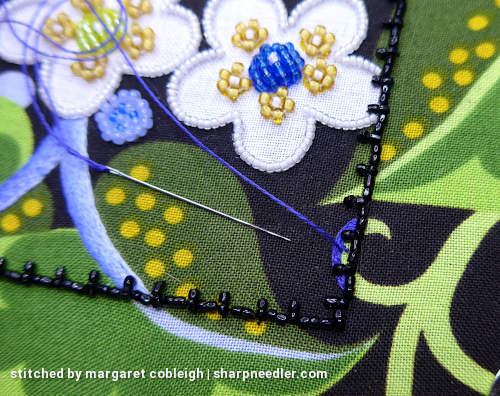 Couching isn't particularly time-consuming, but starting and stopping is. The order of stitching for the beaded lines is similar to goldwork. You couch down the most complete lines first and then add the lines that abut the 'complete' lines. It was called working from foreground to background in the class for this project. 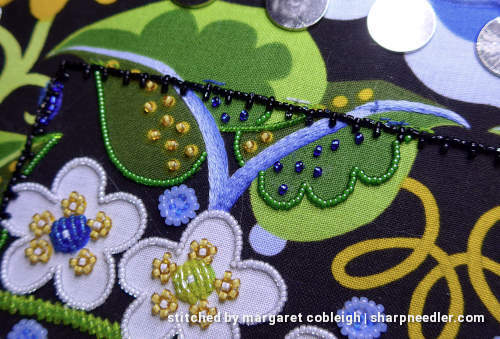 Speaking of stitching order, if I was doing this piece over I would stitch the surface embroidery parts first--just like goldwork--so that the beaded lines would sit on top of the surface stitching. 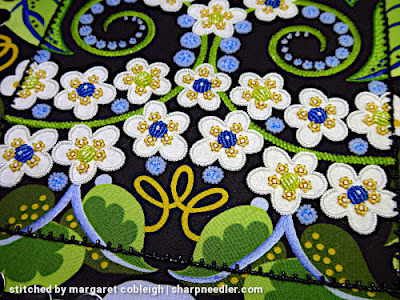 It's more challenging to stitch the surface embroidery after the beaded lines are in place. 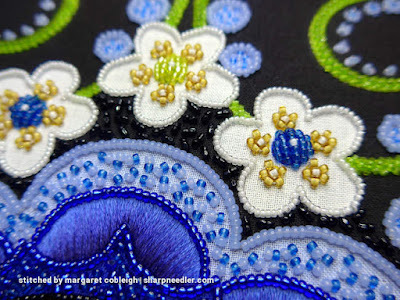 You have to carefully tuck your stitching under the beads being mindful not to disturb the previously stitched beadwork. Of course, when I started this project I didn't know I would be doing any surface embroidery so I had to add it after some of the beadwork. The leaf outlines are finished, except for the ones next to Curly. As I was stitching the leaf outlines I thought, again, about places to add the royal blue beads and decided to try adding a few to the interiors of some of the leaves at the top. This works for me. I'm happy that I now have blue beads in multiple places. The design feels more balanced now. I'm still procrastinating, though, on Curly. There must be something else I can work on in order to avoid working on it! 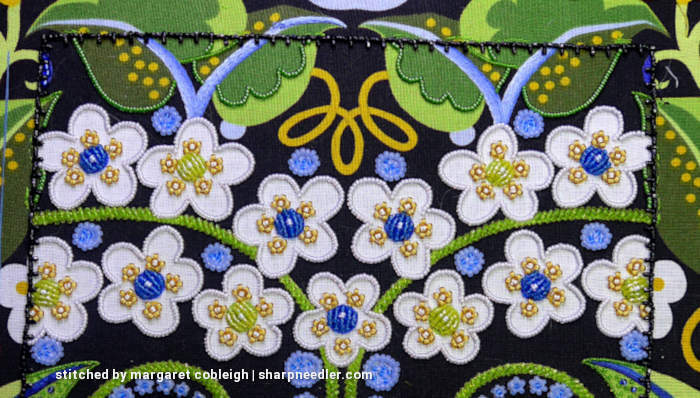 Hmmmm, there's a lot of black background to fill with pairs of black beads applied like seed stitching (called para). 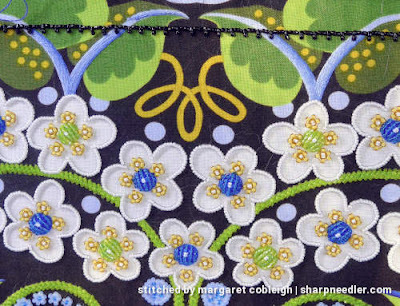 I don't want to have to stitch that all at once because that's too boring, so I think I'd better start doing some of the para. That should allow me to avoid dealing with Curly for a while longer, but not much longer. Thank you! Even though I moan about the tedious bits, I'm having fun working this project and figuring various things out as I go. This is such a beautiful project, I love seeing how you are stitching it and your thoughts as you work through it are very insightful!